After approximately 25 years of working in private agencies, I started a part-time private practice a few years ago focusing on my specialty area of working with clients with substance use disorders. Having worked largely with adolescents, I was looking forward to working more frequently with adults, especially after I had the realization that I was growing older and the adolescents were not. One of my first efforts at outreach was to my state’s monitoring program for licensed health care providers (doctors, nurses, dentists, veterinarians and so on) because I was aware that these professionals are at high risk of substance use problems for a variety of reasons. Over the past eight-plus years, I have found this area of practice to be both stimulating and professionally rewarding. Since that time, the group has grown to include several other health professions and has ranged in size from six to eight individuals. According to the participants’ report, it is helpful to be exposed to the input and perspective of others who have been through the process of addiction (sometimes diverting medications from patients and facing criminal prosecution) as they work to put their lives back together and obtain approval to return to professional practice. Using this experience, I have subsequently established two more recovery support groups in my practice. Both groups are for men in early recovery from substance use disorders, which constitutes a large portion of my clientele these days. In talking with other counselors in private practice, however, I have learned that very few offer group counseling, preferring to stick to the traditional model of one-on-one counseling. Why don’t more counselors offer group counseling? The ACA Code of Ethics includes standards relating to group counseling, including A.9. (Group Work) and B.4. (Groups and Families). Although these standards identify responsibilities that counselors have when choosing to provide group counseling services, none of them includes any admonition for counselors to consider offering group work. What, then, are the potential advantages? Let’s look at three that are most commonly identified. 1) Cost to the client/payer: A ballpark calculation, based on discussions I have had with other counselors, as well as rates posted on websites, is that the per person rate for group counseling is about one-third to one-fourth of the rate that counselors tend to charge for individual sessions. Using an example on the higher end, a counselor who charges $150 for a traditional therapeutic hour (a 45- to 50-minute session) would probably charge $40-$50 per person for group counseling. Many counselors also extend group sessions to 70-90 minutes to allow adequate time for each member to participate. In this day of tightly managed insurance benefits, the cost to the payer is much less in group counseling and tends to give clients the ability to participate for longer periods of time, which is often extremely beneficial. 2) Additional revenue for the practice: Not to be overlooked is the potential that group counseling offers for a practice to enhance revenues. There are only so many hours in the week and a limit to how many clients an individual practitioner can be effective in seeing. High-end estimates tend to run to seeing clients 25 to (at most) 30 hours per week, thus still leaving time for documentation, marketing, practice management, breaks, supervision, etc. Given overhead expenses such as liability insurance, rent, phone service, office supplies and equipment, internet/web access, licensing fees and more, it is challenging for counselors to make an adequate living without following sound business practices. One of these practices can be to offer group services. 3) Enhanced therapeutic value: Finally, as the ACA Code of Ethics stresses, we should ultimately make decisions with our clients in mind, keeping whatever is best for them paramount in our thinking. 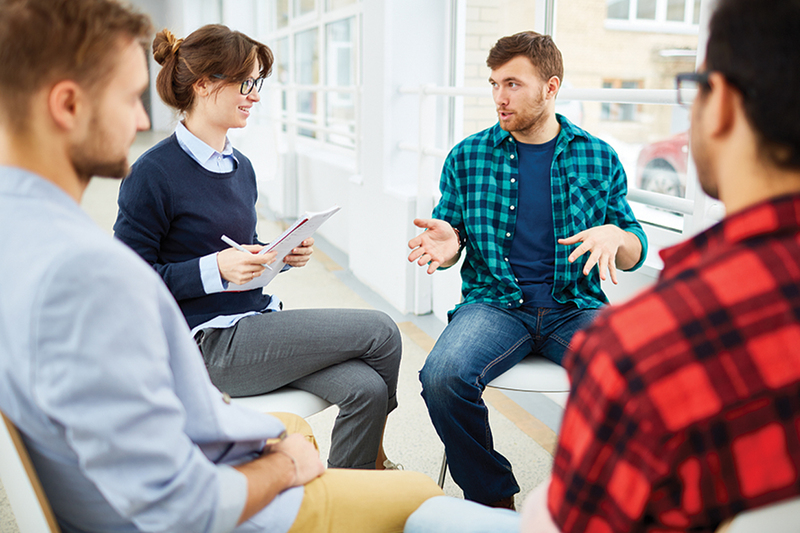 Both research and anecdotal evidence support the provision of group services as an important part of addressing many clients’ needs, with substance use disorder being a clear example. The experience of hearing from other people who are both struggling with the same issues and having success addressing those issues can be life-changing for clients. Likewise, establishing a support network that people can draw on outside of sessions can also be very therapeutic and is an important outgrowth of group work. What, then, might be the disadvantages, and why do so few counselors in private practice offer group services? 1) Scheduling: One of the great benefits of owning a private practice for many counselors is the flexibility it affords them in both their personal and professional lives. In my experience, the days of the client who comes in every Wednesday at 10 a.m. are no longer; in most cases, they have been replaced with a more flexible, variable style. This also gives the counselor the ability to work around a full- or part-time job, family obligations, vacations and other scheduling issues. Groups, however, typically do meet at the same time every week, every other week or monthly. Rescheduling a group involves potentially inconveniencing eight to 10 participants, as well as the counselor, and is much more complex and problematic than rescheduling an individual client. Although I will occasionally reschedule a group in my practice, I usually hire another local practitioner to cover the group, obtaining a release of information from group members to facilitate client coordination with the other practitioner. Having a substitute counselor can supply a healthy change of pace for groups and can enhance the group process in future sessions too. 2) Lack of comfort with group modality: Group counseling classes are included in most counselor training programs, but it is possible for counselors to move quickly into a comfort zone of providing services on a one-to-one, individual basis and allow their group counseling skills to grow rusty. For many counselors, the transition to private practice begins as a part-time arrangement in combination with another full-time job. Thus, it may be many years before the counselor is fully engaged in private practice work as his or her primary activity. This may further contribute to the lengthy delay between when a counselor receives group skills training and finally implements those skills in a private practice setting. This is not the only scenario under which counselors move into working privately for themselves, but this pattern may partially explain why so few private practitioners offer groups. 3) Too much effort to establish: Finally, and related to the scheduling challenges noted earlier, there is the effort required to get a group off the ground. Persuading clients that group counseling is an option worth considering can sometimes be a formidable obstacle. I recall one particular client of mine who was dead set against group work, indicating that he did not want to share his “personal business” with a group of strangers. After nearly two years of relatively successful individual counseling related to his problems with alcohol, he experienced a serious relapse, leading to inpatient treatment — where groups were a large part of the service delivery system. Upon returning to the community, he has engaged with his group and finds it to be an essential part of his overall recovery program. On a more mundane level, simply finding a time that works for all potential members and the counselor can be a significant challenge. I have had some luck holding groups early in the morning, before many people start their workdays. Other options might include lunch-hour meetings, evening sessions or even weekend slots. Sometimes, however, the difficulty of establishing a regular meeting time can be so daunting that it prevents counselors in private practice from even attempting to start groups. In summary, groups can provide a tremendous therapeutic opportunity for our clients to address their issues with the assistance of others who are confronting similar problems. Counselors should consider this modality more frequently as they look to simultaneously improve their work with clients and solidify their private practices from both a quality and financial standpoint. Opportunities for retraining for those professionals who have not had group experience since graduate school are abundant. These opportunities include myriad continuing education options such as conferences, webinars and self-paced reading. Additionally, counselors can partner with other professionals in a co-facilitation arrangement. This may negate some of the financial upside of group work, but it can also assist in providing built-in coverage should a counselor need to miss a session. Ultimately, as we ponder as counselors how best to meet the needs of our clients, group work should be something that we all consider as part of our ethical responsibility. Kevin Doyle, a licensed professional counselor and licensed substance abuse treatment practitioner, is chair of the Department of Education and Special Education and an assistant professor of counselor education at Longwood University in Virginia. Contact him at doyleks@longwood.edu. I think that the idea of a group counseling setting seems like a great way for teens and adults to be able to get the help that they need in a more comfortable setting. I know that a lot of people feel uncomfortable talking and sharing their feelings to a counselor in a one on one setting. Another thing is that with the group option a family member or friend could go with the person that needs help with counseling to feel more comfortable.